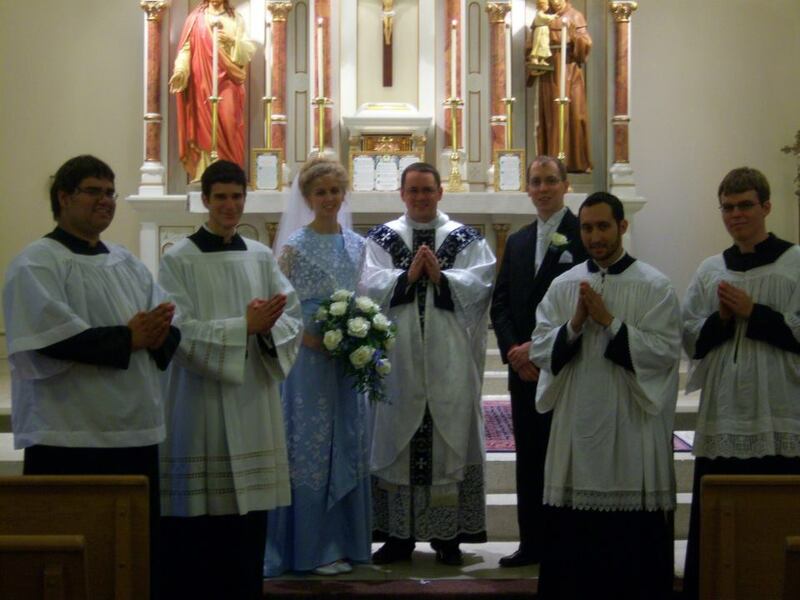 I missed a great wedding of two lovely young traditional Catholics, who were married on Saturday in Illinois. I have permission to put these great photos on this blog to show modesty in weddings. 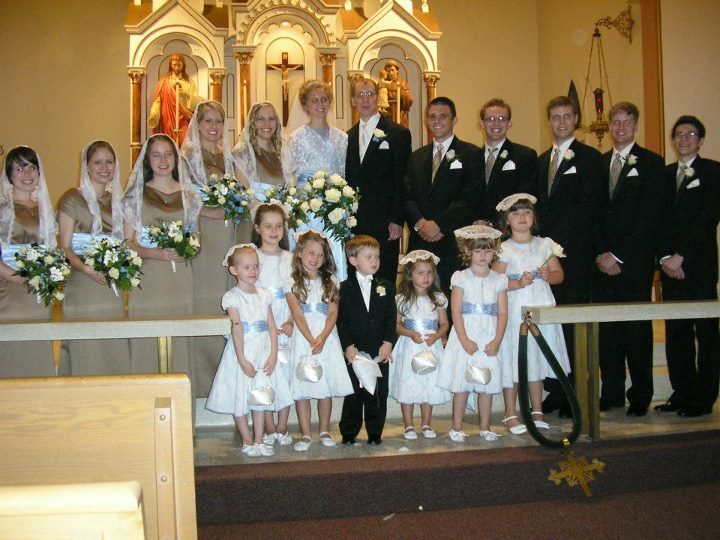 This is a family which was renewed about ten years ago by going to the Tridentine Mass. 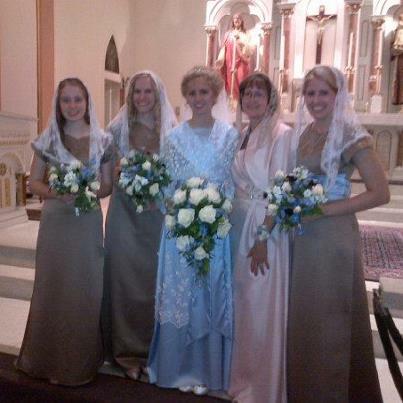 The lovely bride is in blue with lace on the outside. Her bridesmaids and maid-of-honor are wearing mantillas, which is so lovely. Great ideas for others to follow. And the mother-of-the-bride, my good friend, looks fantastic. 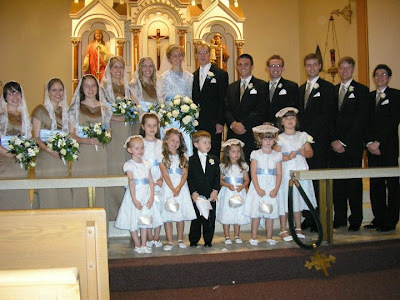 See how beautiful modesty is...and a nice, BIG CATHOLIC FAMILY, as all the girls above are sisters and two of the groom's men are their brothers! There was no kiss, no unity candle and no clapping...we can change the culture through the TLM. And, the invitations indicated that the guests were to wear modest and respectful attire as well. That is a great idea for families, where some are not familiar with the TLM culture of modesty. A food post. 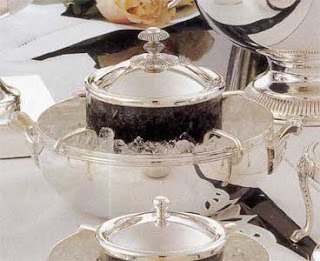 Did you know some of your caviar could come from Iowa? But, fish are dying at a terrific rate because of the heat and drought. Why doesn't the USCCB call for three days of prayer and fasting for rain? Whenever we suffer some affliction, we should regard it both as punishment and as a correction. Our holy Scriptures themselves do not promise us peace, security and rest. On the contrary, the Gospel makes no secret of the troubles and temptations that await us, but it also says that he who perseveres to the end will be saved. So we must not grumble, my brothers, and for as the Apostle says: some of them murmured and were destroyed by serpents. Is there any affliction now endured by mankind that was not endured by our fathers before us? 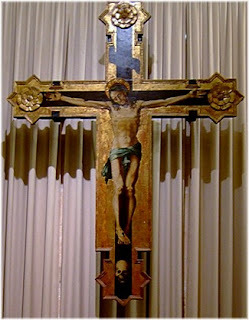 What sufferings of ours even bear comparison with what we know of their sufferings? How then can you think that past ages were better than your own? NEW YORK, August 6, 2012 (LifeSiteNews.com) - Fr. Frank Pavone of Priests for Life has issued a statement opposing President Obama’s appearance at a New York fundraiser dinner for Catholic Charities. On Beauty and Harmony in Christ. But, with all of this, I want to look at a beautiful speech of our saintly Pope Benedict XVI from Zenit and other news sources. A group from Bavaria, (which I would LOVE to visit) brought a mini-folk festival to Castle Gandolfo. 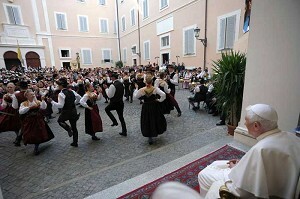 The Pope stated after being treated to a late birthday present of dancing and singing, that their culture was one of beauty. "It is not simply a matter of entertainment, but of a culture of gladness, imbued with joy; it is born of an interior acceptance of the world, of an interior 'yes' to life that is a 'yes' to joy," he said. "It is founded upon the fact that we are in harmony with creation, in harmony with the Creator himself, and for this reason we know that it is good to be a person." A usual, this is profound. Beauty is an attribute of God, as I have have mentioned here and elsewhere, and we engage in that Beauty through prayer and reflection, as well as creation. We, like God, who made us in His Image and Likeness, create beauty. Beauty does come from harmony and peace, but also reflection. The Pope said that in Bavaria, it is "easy to recognize that God is good and be glad about it" since the region is so beautiful. At the same time, the Pontiff continued, God has made the region beautiful with the collaboration of the local people. "[T]he men who live in this land, precisely from their 'yes,' knew how to give it its complete beauty; it became so beautiful only through the culture of persons, through their faith, their joy, songs, music and art. The Creator did not wish to do this alone but only with the help of men." It is our duty to create and be beautiful spiritually. One reason why we encounter hatred if we are walking with Christ is that evil is ugly and hates beauty. Notice this in the culture of death, which is also the culture of ugliness. Ever the teacher, Benedict XVI went on to note that "someone could ask whether it is right to be so happy when the world is so full of suffering, when there exists so much darkness and evil? Is it right to be so high spirited and joyful?" "The answer can only be 'yes!'" he affirmed. "Because saying 'no' to joy we do nothing of use to anyone, we only make the world darker." 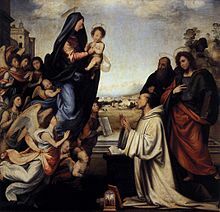 I think of St. Augustine and St. Bernard of Clairvaux who both encountered God as the Beautiful. To know God is to desire Beauty. So, our ancestors, when they created beautiful Churches in the wilderness which were beautiful, were in touch with God in a way that we are not. We must, absolutely must, remove ugliness from our lives. Do not watch television. Read news and be selective. Do not listen to the radio. Find the news you need online. Listen to classical music, and create, even in simplicity, a beautiful habitat for yourself. Plant flowers..pray. Do not collect ugly things. If something is not beautiful or useful, throw it out. Surround yourself with positive people so that you can reach out to those caught in ugliness. "From our faith we know and every day we see that the world is beautiful and God is good. And because of the fact that he became man and dwelled among us we know it definitively and concretely: yes, God is good and it is good to be a person. We live in this joy, and from this joy we try to bring joy to others, to reject evil and to be servants of peace and reconciliation." 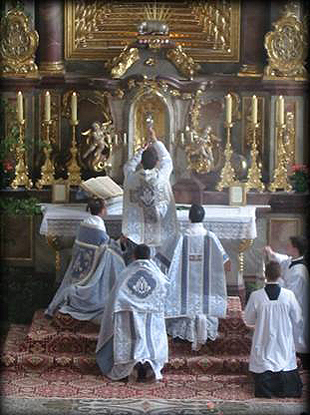 We can change the world through Beauty, especially through the Tridentine Mass. And, to become beautiful, one must go to the sacrament of Confession often and Mass daily, if possible. Choose beauty and be a light in the world. Christ came to us in simplicity, but His Beauty has changed the world. We must cooperate in that change and mission. Only in Christ are we in harmony. What would Fr. Z. say to this...? Well, the little squirrel died of stress. I can understand that. But, a good effort none the less.. Sad animal story...do you have a happy animal story to share? BERLIN (AP) -- A squirrel with olive oil? For police in northern Germany, that was a winning combination to free an animal trapped in a manhole cover. Police spokeswoman Kathrin Feyerabend said Monday a woman on the outskirts of Hannover discovered the red squirrel Sunday after hearing its cries. 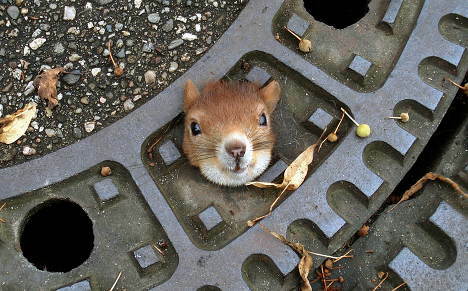 Its head was poking up above ground through a hole in a manhole cover, its body dangling beneath. After unsuccessfully trying to push the head back through gently, police officers removed the cover and rubbed olive oil around the squirrel's neck. Holding back its small tufted ears, they were able to successfully release it. But Feyerabend says the happy ending was short lived -- the squirrel died several hours later, likely from stress. The same is true for us in our spiritual lives. We need to ask ourselves and our friends if we speak to them of spiritual things, "What did you ask of God today?" And, "What did God tell you?" So many people are AFRAID to listen to God. They are so sure He is going to only list their sins and imperfections. In this series on perfection, I am not trying to discourage anyone, but show what not only is possible, but what is required. We can give up too soon. And, I must reiterate that success in the world does not equal spiritual success, or to put it in the opposite way, spiritual success is not seen by physical or material success. That is a heresy and one which grips America. What will happen in a financial meltdown? Without the life of the virtues, we shall not be able to withstand the winds of despair which so many people will experience in their lives. Someone asked me why I was so hard on myself in certain areas of my life. She is an Irish friend of mine and we were discussing things like weekly Confession, fasting, and daily examination of conscience. She said that she would not be able to walk in the light of all the pain such examination would bring. I could only say that if I was not cooperating with what the Church as deemed are aids to salvation, I could be damned forever. I ask God to show me my sin and He does, regularly. God speaks to others as well and if we are open, we can discern the Voice of God. Not all criticisms are from God, however, and one must always take these to a Confessor or spiritual director. This is why it is important to be real with one's self and be obedient to the Church. The Church is my shelter in the storms and more storms are coming soon. We know what these are. Find a community or help build one. Strengthen yourself and each other. Be patient and ask the right questions of God. He will always answer you. But, you may have to be persistent, especially if you sinned greatly in your life. That is what the lives of the saints show us. Do not be discouraged and do not give up. Be accountable. Be honest. Be the child of God you are. And, I would like to add for two young men I know who were not recently accepted into the seminary of their choice, that they should try diocesan seminaries. Traditional communities are orders, and the secular or diocesan priests are not under the same disciplines as orders. Orders are also missionary and one could be sent anywhere, whereas diocesan priests, in most circumstances , serve the people in one area. These calls are not the same. Part of discerning your call to the priesthood is not being closed to the diocesan priesthood, where many, many young men are going to be ordained knowing and wanting to say the Latin Mass in the future. Do not be discouraged. If a person truly has a vocation, God will find you your place in the Church. Ask questions before you go. 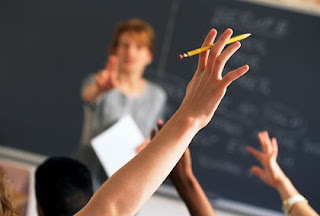 Learn about the seminary before you approach the order. Consult constancy with your spiritual director and if you do not have one, get one. We need good, orthodox diocesan priests. God may be using your experiences for your own purification. In a post in the recent past, I mentioned that the remedy for the sin of pride was to remember who we really are in the sight of God. Here is a key to all of this. If we fight purification and do not let God try us, He will not abandon us, but come again and again with sufferings until we are purified. He is faithful, if we truly want to become saints. If we fight purification, this level will be prolonged. Too many people seek healing without repentance. The two must go together. Garrigou-Lagrange continues, quoting St Catherine of Siena, who I have quoted here before. She notes that pride leads to self-deception and a lack of knowledge of spiritual things. She also reminds us that pride leads directly to disobedience. The remedy for pride is suffering and purification. One must ask for this and mean it. Out of this comes humility and patience, self-knowledge and an obedient spirit. So, the remedy for pride is the dying to self, and how many virtues will come of this out of the 40? The most important are the Cardinal Virtues mentioned before, but again stressed here. These are prudence, justice, temperance and fortitude. These are remedies for pride. Patience, humility, long-suffering, kindness, love of neighbor, generosity or largesse, and gratitude can spring out of this purification. If one avoids it, one will not see God. There are a few innocence souls who reach heaven without great purification, but these are few. May I end this post with a quotation from Homer, the great Greek poet: "Adversity has the effect of eliciting talents which in prosperous circumstances would have lain dormant."